NABF and NABO Super Featherweight champion Ryan “Kingry”Garcia (15-0, 13 KOs) and NABA Super Featherweight Champion Carlos “The Solution” Morales (17-2-3, 6 KOs) hosted a media workout at Legendz Boxing in Norwalk, Calif. on Monday, Aug. 27 ahead of their 10-round non-title fight. 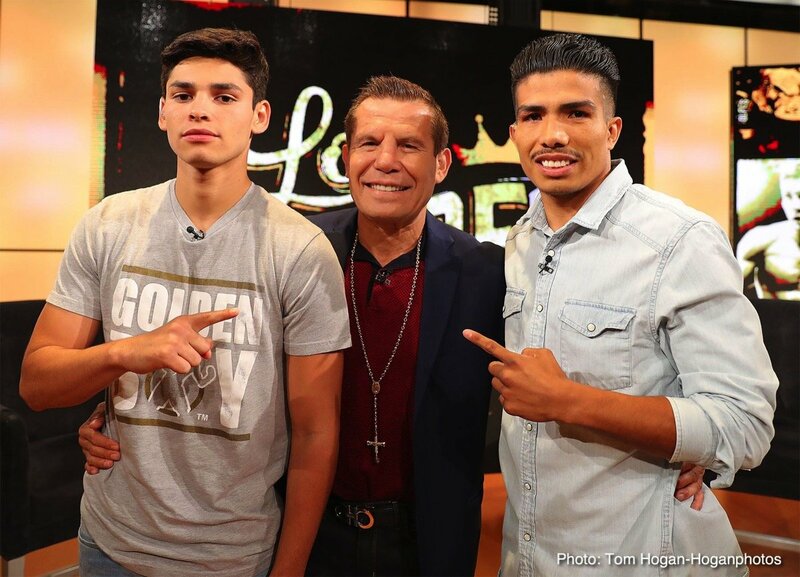 The two also participated in a media tour at ESPN, including a visit on the TV show A Los Golpes along with Mexican legend Julio Cesar Chavez Sr. Their battle, which will be held in the lightweight division, will be the main event of the Sept. 1 edition of Golden Boy Fight Night at Fantasy Springs Resort Casino in Indio, Calif. The action will be streamed live on Facebook Watch in the U.S. and globally on the Golden Boy Fight Night Page. 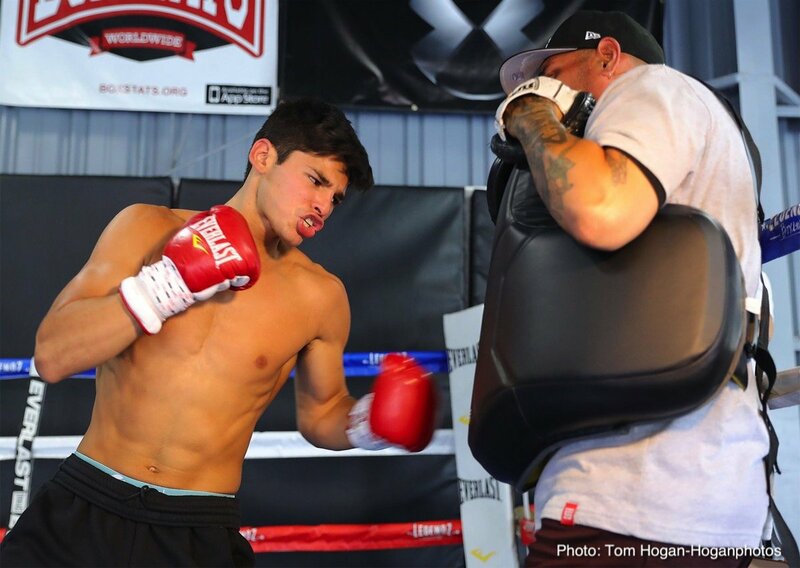 Marvin Cabrera (8-0, 8 KOs), a native of Mexico City, Mexico, also participated in the workout ahead of his fight against Neeco “The Rooster” Macias (16-0, 9 KOs) of Lancaster, California in the co-main even, which is scheduled for eight rounds in the super welterweight division. 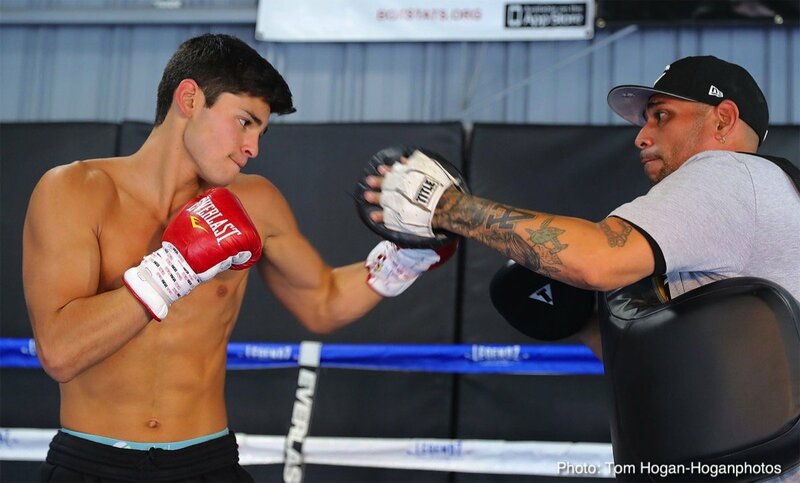 Rising welterweight prospect Alexis “Lex” Rocha (11-0, 8 KOs) of Santa Ana, Calif. also participated in the workout. 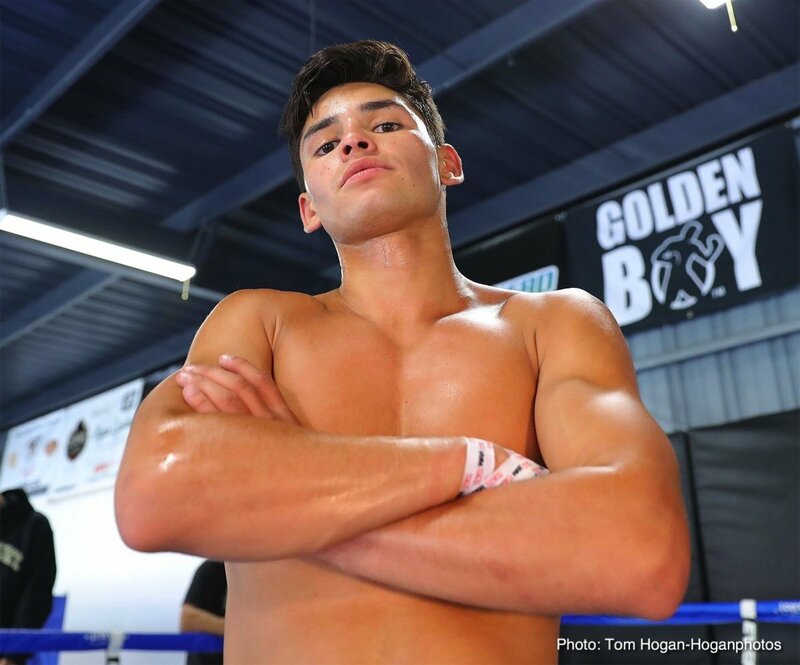 This explosive prospect will be part of the stacked Canelo vs. GGG 2 undercard on Sept. 15 at T-Mobile Arena in Las Vegas. Promotions. The event is sponsored by Tecate, “THE OFFICIAL BEER OF BOXING,” and Hennessy, “Never Stop, Never Settle.” The fights will take place Saturday, Sept. 1, 2018 at Fantasy Springs Resort Casino in Indio, Calif.
Canelo vs. GGG 2 is a 12-round fight for the middleweight championship of the world presented by Golden Boy Promotions and GGG Promotions. Munguia vs. Cook is a 12-round battle for the WBO Junior Middleweight World Title presented by Golden Boy Promotions and Zanfer Promotions. Lemieux vs. O’Sullivan is a 12-round middleweight clash presented by Golden Boy Promotions and Eye of The Tiger Management in association with Murphy’s Boxing. 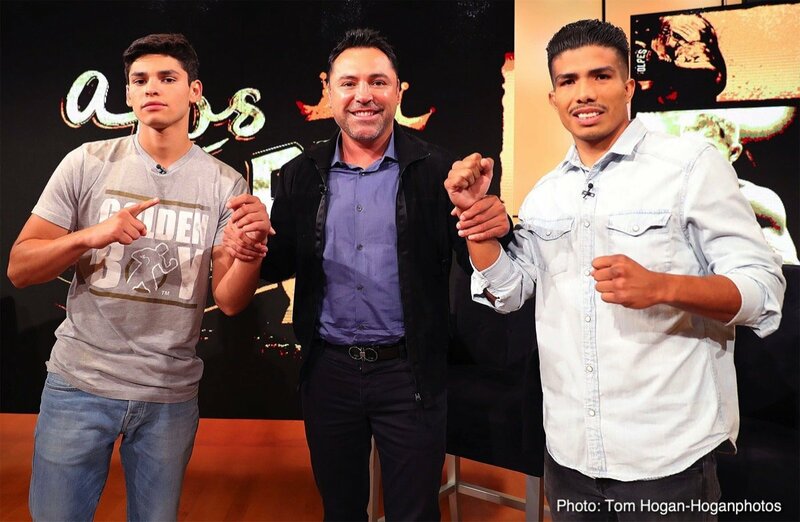 Gonzalez vs. Fuentes is a 10-round super flyweight fight presented by Golden Boy Promotions and GGG Promotions in association with Teiken Promotions and Zanfer Promotions. The event is sponsored by Tecate, “THE OFFICIAL BEER OF BOXING,” Hennessy, “Never Stop, Never Settle,” O’Reilly Auto Parts, Fred Loya Insurance, Interjet, Venom, and Fathom Events. The event will take place Saturday, Sept. 15 at T-Mobile Arena in Las Vegas and will be produced and distributed live by HBO Pay-Per-View beginning at a special time of 8:00 p.m. ET/5:00 p.m. PT. “24/7 Canelo/GGG 2” premieres Tuesday, Aug. 28 at 11:30 pm (ET/PT) on HBO. Canelo’s fifth “24/7” appearance and Golovkin’s third, “24/7 CANELO/GGG 2” is the latest installment of the acclaimed franchise that began in 2007. Limited tickets for Canelo vs. GGG 2 are still available, and are priced at $5,000, $2,500, $2,000, $1,500, $800, $700, and $500 not including applicable service charges and taxes. There will be a limit of eight (8) per person at the $5,000, $2,500, $2,000, $1,500, $800, $700 and $500 price levels. To charge by phone with a major credit card, call 888-9-AXS-TIX (888-929-7849). Tickets are also available for purchase at www.t-mobilearena.com or www.axs.com.